A science project that a group of students from British Columbia dreamed of launching into space is on its way to the International Space Station. 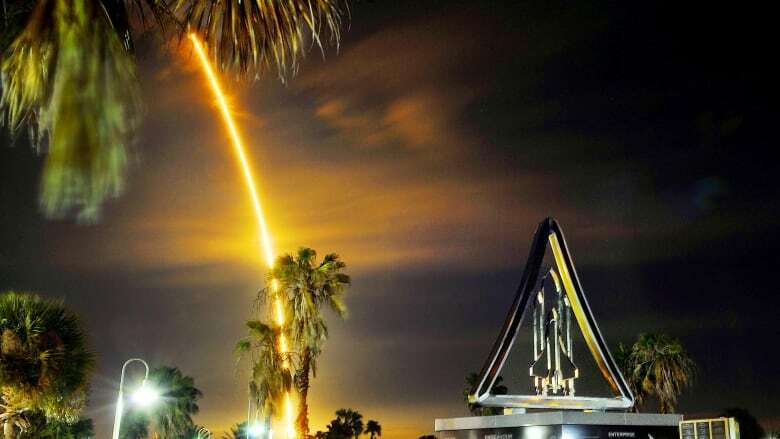 Four boys from McGowan Park Elementary School in Kamloops celebrated after the SpaceX Falcon rocket carrying their project was successfully launched early Saturday from Cape Canaveral, Fla. The students won a contest last year to have their experiment join 17 other student projects from across North America on a trip to the space station. However, they suffered a major blow in October when the NASA-contracted rocket their project was aboard exploded in a spectacular fireball in eastern Virginia. On Saturday, the Dragon capsule carrying the experiment separated from the SpaceX booster and continued its journey to the ISS. However, the Falcon booster failed in its attempt to land on a barge in the Atlantic. Hunter Galbraith, 13, said he felt hopeful the rocket would be launched successfully this time, but he still felt a little nervous. "It was almost a little nerve-wracking, because we didn't know if it was going to make it up this time or if we'd have another catastrophe on our hands," he said. He and his three close friends — Kieren O'Neil, Ryan Watson and Jordan Brown — are now in Grade 8 at a separate school. They were stunned when they watched the rocket explode the first time. Brown, 13, recalled that he was so shocked he started to laugh. "I was very sad, but I was also laughing, just because all that work went up in a blaze of glory," he said. "All of that work, just under a year of work, just gone in a mere seven or eight seconds." Rebuilding the project was a daunting task, but the students used the opportunity to improve the experiment. "I think we probably did our math a little bit better, and got the right chemicals with the right measures," Galbraith said. The rocket was launched from Cape Canaveral in Florida at about 1:45 a.m. Saturday and is expected to dock the International Space Station by Monday. Sharmane Baerg, the boys' former Grade 7 teacher, said the experiment could be returned to Earth as soon as February. She said Saturday's launch was actually the ninth try, after several rocket launches were delayed. "You keep your fingers crossed," she said. "You think what else can I do to send positive vibes to the rocket so that it does take off?' It was really interesting to watch it. It was smooth, there were no complications, no hiccups." The projects are part of the Student Spaceflight Experiments Program, which is run by the Arthur C. Clarke Institute for Space Education. The local school district in Kamloops raised $25,000 to secure a spot on the mission. Student groups within the city then competed to determine which project would be selected. The rocket involved in the failed October launch was Orbital Sciences' Antares rocket. No one was hurt in the explosion, but it damaged a state-owned launch pad at NASA's Wallops Flight Facility. Officials hope to have the launch pad repaired and ready for testing late next year.